Novotel Clarke Quay is atop Liang Court Mall, right beside Clarke Quay’s active nightlife. A stroll from the MRT train station, it offers an outdoor pool and 3 restaurants. Modern rooms at Novotel are equipped with a flat-screen cable/satellite TV, minibar and safe. Most rooms come with a private balcony and views of the city and Marina Bay. Guests can work out at the fitness center, make travel arrangements at the tour desk, or purchase souvenirs at the gift shop and newsstand. Laundry and concierge services are available. Views of the Singapore skyline and the resort pool accompany buffet spreads at The Square Restaurant, which features an open kitchen and a choice of indoor or open-air seating. Other dining options include Chinese and Indian restaurants. Le Bar Rouge serves refreshments and signature cocktails. 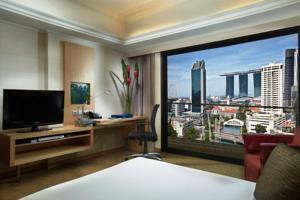 Novotel Clarke Quay is 11 miles from Changi International Airport. The hotel is a 5-minute drive from Chinatown and the shopping belt of Orchard Road. Up to 2 children (15 years and under) stay free when sharing with parents. Rooms: Hotel Rooms: 401, Hotel Chain: Novotel. Wired internet is available in the hotel rooms and costs SGD 30 per 24 hours. Free! Up to two children under 15 years stay free of charge when using existing beds. There is extra beds/baby beds in a room is 0 capacity for extra beds/cots in the room. American Express, Visa, Euro/Mastercard, Carte Bleue, Diners Club, JCB The hotel reserves the right to pre-authorize credit cards prior to arrival.